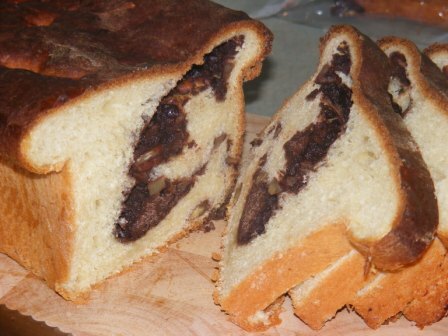 The first of my two “official” blog posts for the Yeast-Risen Specialties section of the Modern Baker Challenge is a delicious recipe, Chocolate Babka. This bread is Eastern European in origin, most likely Russian. 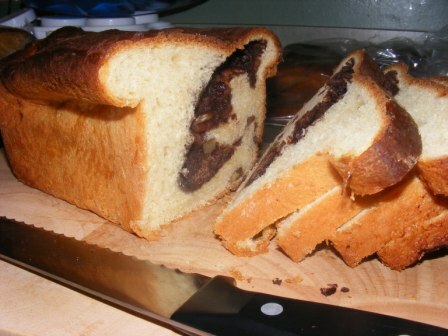 The dough is enriched with milk, butter, egg yolks, and sugar, and filled with bittersweet chocolate and nuts. I began by heating the milk, then mixing in the yeast, butter, sugar, salt, egg yolks, and vanilla. I stirred in half the flour with a rubber spatula, then mixed in the rest, one-half cup at a time, with the electric mixer. After all the flour had been added, I mixed the dough for two minutes, rested it for 10 minutes, then mixed for another two minutes. I scraped the dough, which was very slack, into a buttered bowl, then put it in the refrigerator. It was supposed to chill for an hour and a half, but I had some errands to run, so it stayed in the fridge for about three hours. I don’t think the long, cold fermentation hurt the dough, but when I scraped it out onto the bench, it was still very slack. 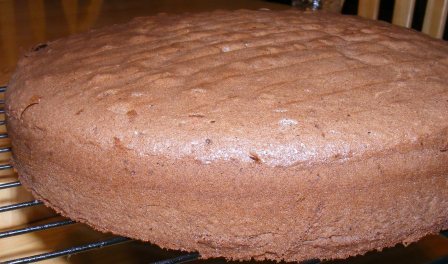 I sprinkled the board with flour, but should have floured it more heavily. I should also have floured the top of the dough a bit. I patted out the dough, but it was so sticky, it was hard to manage. 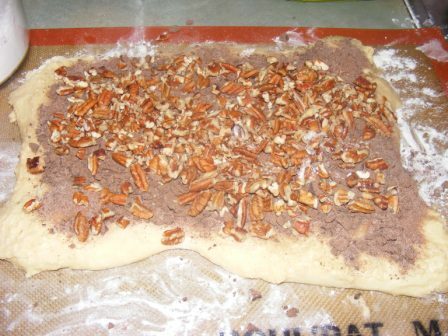 After pressing it out into a rough rectangle, I sprinkled the dough with the bittersweet chocolate mixture (chocolate, dark cocoa, sugar, and cinnamon) and chopped nuts. I had quite a time rolling the dough, as it wanted to stick to the mat, my hands, and itself. It wasn’t pretty, but I finally got the dough rolled into a rough loaf shape, which I cut in half, then wrestled into two loaf pans. 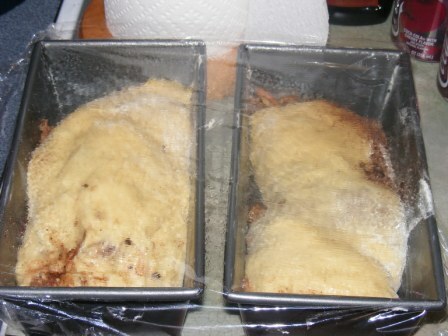 The loaves proofed for about two hours, until the dough crested the tops of the pans. I baked the loaves for 45 minutes at 350°. I took the bread out of the oven, cooled it in the pan for 10 minutes, then removed the loaves and finished cooling them on their sides so the loaves wouldn’t collapse. What this bread lacked in appearance and manageability, it more than made up for in taste. The bittersweet chocolate was delicious, and the cinnamon gave it an additional depth of flavor. The next time I make this bread — and there will certainly be a next time — I’ll flour the board and dough more heavily to make it easier to handle. But even with the difficulties I had, this bread was definitely worth the effort. This is the 11th recipe, and the last of the scones, in the Modern Baker Challenge. 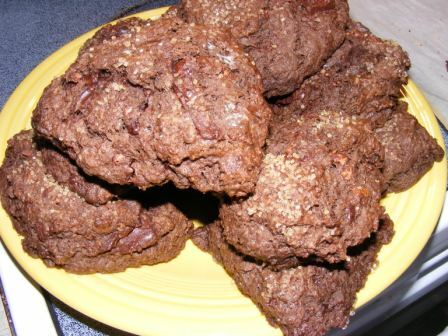 As the name indicates, these scones are loaded with chocolate. They have Dutch process cocoa, milk chocolate, and bittersweet chocolate. The three combine to make these scones rich and deeply flavored. Surprisingly, though, they are not overly sweet. As with Real Welsh Scones, Ginger Scones with Almond Topping, and Butterscotch Scones, the dough is mixed up quickly in the food processor. The milk chocolate, sugar, and cocoa are pulsed a few times, then the flour, baking powder, and salt are added, and the mixture is pulsed again before adding the butter and pulsing until it resembles coarse corn meal. 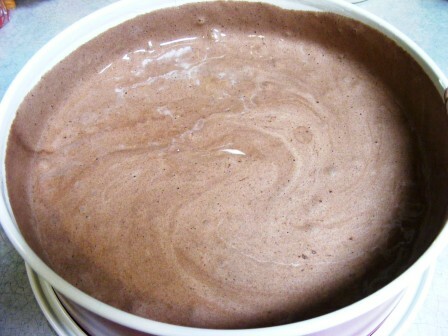 Finally, the bittersweet chocolate, egg, and milk are added and pulsed a few more times. I finished kneading the dough on a Silpat, divided it into three pieces, and formed each piece into a sphere. I cut each sphere into four wedges and placed the wedges on a baking sheet. Although the recipe didn’t call for it, I sprinkled each scone with turbinado sugar, both for a little additional sweetness and for appearance. The scones were baked at 400° F for about 17 minutes. 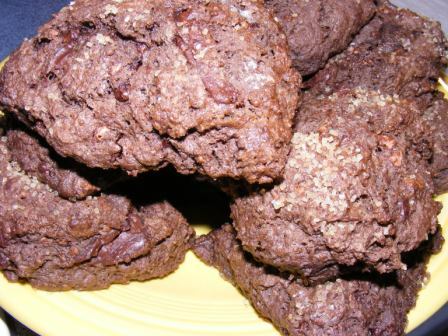 They were moist, gooey, very chocolately (of course), rich, and delicious. These scones just barely edged out the ginger scones as my favorite scones in the book. In fact, they rank near the top of my list in the whole Quick Breads section. If you’ve been thinking of giving The Modern Baker (the book and/or the Challenge) a try, start with this recipe. It will make a believer out of you. 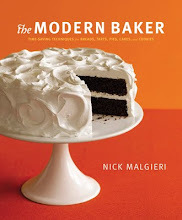 The Modern Baker Challenge will be kicking off in a few weeks. I’m very excited about this challenge for several reasons. I have quite a sweet tooth, so a challenge including cakes, pies, and torts seems right up my alley. And speaking of pies, I’ve never been much of a pie maker, and I’m hoping this challenge will change that. But the thing I’m most excited about is that I asked my 12-year-old to bake along with me, and she said yes! I love baking with my kids, and the thought of making 150 recipes over about two years with her thrills me to no end. I’m hoping that, in addition to us both developing some mad baking skills, I’m able to impart a few things to her, most especially the importance of using mise en place and of cleaning up as you go. Tall order, I know. But as I said, I have two years to accomplish it. We are both so excited about the challenge that we started baking out of The Modern Baker about a week ago. So far, we have made Fennel Fig & Almond Bread (the first recipe in the book) and the subject of this entry, Cocoa Banana Muffins. 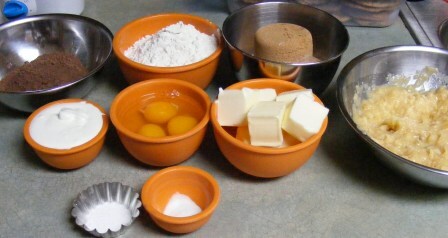 We started the muffins with our mise en place. Although the recipe calls for quite a few ingredients, they are mostly things you probably already have on hand. The only thing I had to buy was Dutch process cocoa powder, not because I don’t normally keep it but because I was out. That and a few overripe bananas, and we were good to go. While Molly mixed the batter, Abby and I prepared the muffin pan. 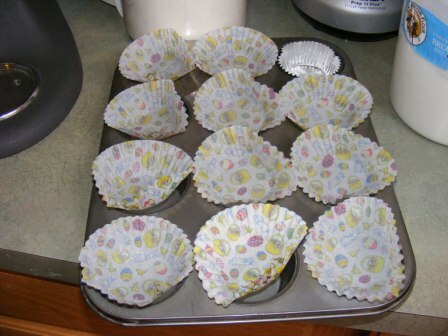 The recipe makes 16 muffins, so we used our 12- and 6-cavity muffin tins. If you only have two 12-cavity tins, remember to fill the unused tins about half full with water to keep them from scorching. 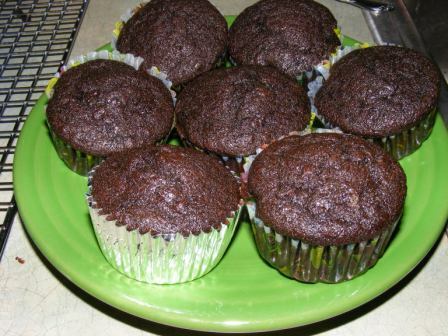 We baked the muffins in a 350 dF oven for 30 minutes, until the cake tester came out with just a few moist crumbs. The house smelled amazing, and the muffins looked great. We waited until they cooled, then began devouring them. 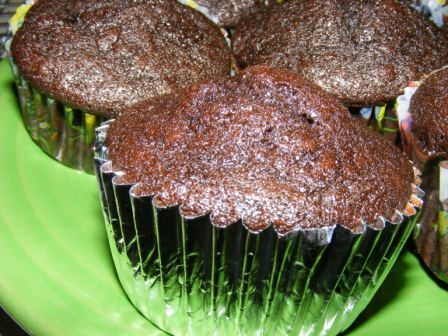 The dark cocoa made a huge difference in both the appearance and taste of these muffins. They were very moist and tasted more like cupcakes than muffins. Perfect with a cup of coffee or tea, these muffins would make a great addition to a weekend brunch with friends.